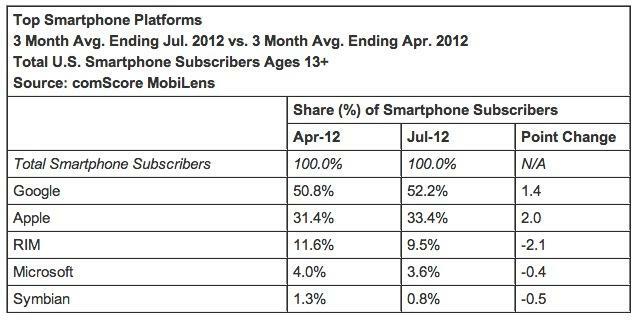 According to the latest data from comScore's MobiLens service, Google's Android continued to enjoy the lion's share of the smartphone market, taking 52.2 percent of smartphone subscribers, up 1.4 percent from May, while Apple managed to gain 2 percent to finish with 33.4 percent over the same period. Beleaguered BlackBerry maker RIM continued its decline, dropping 2.1 percent to fall below the 10 percent mark, finishing July with a 9.5 percent share of the market. Out of the 234 million Americans age 13 and older who own a mobile device, 25.6 percent use a Samsung product, down 0.3 percentage points from the prior period. Following the Galaxy maker was LG's 18.4 percent share of the market, down a slightly more significant 0.8 points. Although firmly seated in third place, Apple was the only top-three manufacturer to gain market share during the three month period, gaining 1.9 points to end with a 16.3 percent share of mobile subscribers. 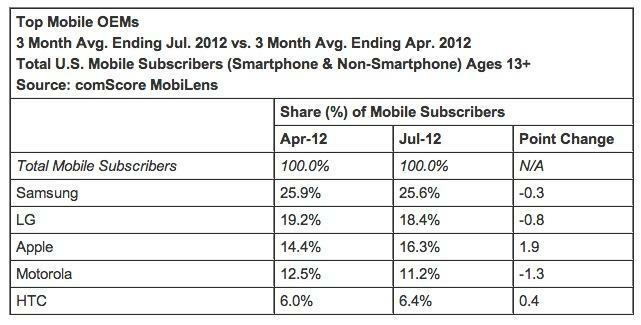 Rounding out the top five were Motorola and HTC with 11.2 percent and 6.4 percent, respectively. The firm said text messaging was up 1.5 points in July, with over three quarters of subscribers using the service at 75.6 percent. Mobile internet browsing was also up, with 51.2 percent of owners accessing the web, while use of social networking sites grew 1.9 points to reach 37.9 percent. Interestingly, the number of people listening to music on their devices rose 2.5 points to hit 28.3 percent.